A deli-restaurant in an industrial section of Brooklyn, in the shadow of the BQE. 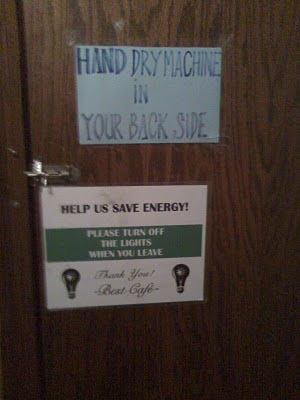 In the men's room, after you wash your hands, you want to dry them. But the hand dryer is a little hard to spot. It's smaller than the average hand dryer, and it's on the wall behind you. So you might not see it. And since there are no towels, you might be tempted to just walk out the door with your hands still wet. The management, therefore, wishing to be helpful, put a sign on the door telling you where the dryer is. A sign to tell you that the dryer is right behind you. George, I LOL! Hilarious. Only in New York? Probably.